You might have heard the term Out of Box several times during all these years and understood that it means you have to be exceptional. Perhaps you have attempted it over various print and social media platforms, too. Have you ever thought of synchronizing the term with magnet advertising? 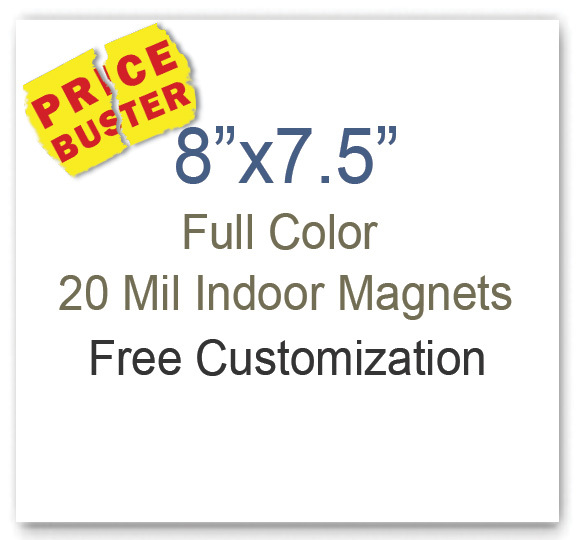 This blog educates about employing 8×7.5 magnets for out of box marketing strategies. We have only tried to tell you elements that you can incorporate over these customized magnets, while designing an out of box marketing strategy. Although magnet advertising allows you to get viral and touch base with all your clients, still you need to court the ones, who may contribute to your business. This type of conviction only comes through years of industrial experience. For example – If you sell apparel and have noticed that women in their 20’s are your customers than those in 50’s. Perhaps you can urge them to share their contact details with you whenever they purchase from you. Use contact details to court them for further purchases. You better know how to make this situation out of the box than we telling you. Isn’t it? Don’t forget to employ customized 7.5 x8 magnets for the purpose. It may sound that funny, but it works! You can hand over 8×7.5 magnets printed with your brand information during tradeshows, movie screenings, or other places. Here is a brilliant example to consider – a less-known travel agency tried to build brand impact by pursuing customers during a tradeshow. The travel agency representatives greeted people at the welcome area and urged them to try their win free vacation program. They asked people to like their Facebook page immediately through hand held tablets and took down their contact details. Furthermore, they organized small travel game programs for people to prove that they are real. This not only helped them to canvas consumers, but also helped them to ease and mix up with people on personal level. Tell us, what is the difference in your bakery advertising “60% discount on pastries” or others advertising “save 30% on creamy and crispy croissants + 30% on fat.” Perhaps you are giving them savings more than they expect, whereas the other marketer is giving them assurance of health, which will keep them going for long, even after enjoying the pastry! You have to find opportunities to package your services and products uniquely. You can present your business over these custom magnets 8×7.5 in places, where they are least expected. The success of Out of Box Marketing largely depends on your ability to create, converge, and converse. You can attempt various marketing strategies over customized 7.5 x8 magnets because it offers large room for experimentation. By ordering these promotional magnets from any reputed online eCommerce store, you can save on online design proof, art setup, shipping, full color printing, and efforts!